“The life of Sai Baba is as wide and as deep as the infinite ocean; all can dive deep into it and take out precious gems (of knowledge and bhakti) and distribute them.” - Sri Sai Satcharitra. The life of Sai Baba depicts utmost spirituality in every area of human life. His life history is sacred and an indispensable guide to a novice who has just commenced his spiritual career. Even to an adept who is at the proximity to the goal it has a message to deliver. Life both in its secular and sacred aspects gets abundantly enriched by the application of the tenets of the Sai’s life. There are so many books available on Sai Baba. But the work done by Dr.S.V.S.Kishore Kumar is very lucid, understandable to a common man and easy to read. Any book for that matter should have the quality of conveying the theme in a simple way. The book is a great experiment and will help the society to grow up with moral values and humanity. 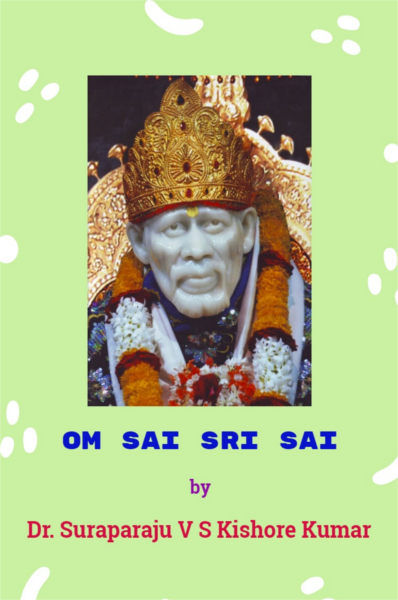 Unique features of this work include the appropriate experiences of devotees of Sai Baba and this drives everyone towards positive thinking and adopting of moral values to live in the modern society. An excellent composition of the book deserves all appreciation. This book undoubtedly serves to enlarge the horizons of spiritual practitioners.